Empty kit bag (or if using a raw PCB, aquire parts) and verify contents. 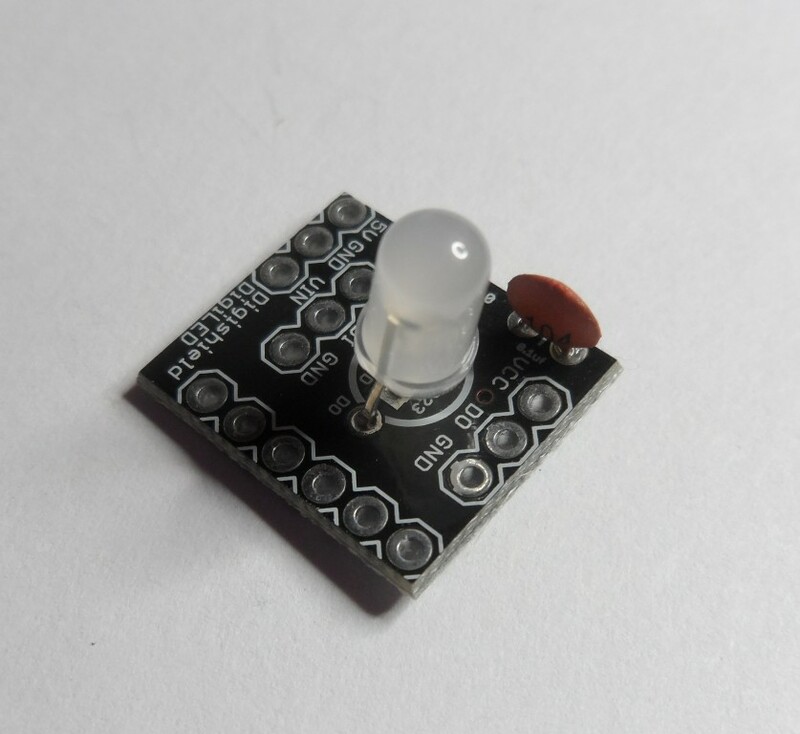 When inserting the LED into the board ensure the two longer leads of the LED goes through the holes marked data out and ground (see photo) - this ensures you have the LED oriented properly. Solder the LED leads and clip off the excess. Insert the capacitor on the top of the board (as shown), solder leads on bottom. Orientation of the capacitor does not matter. Your DigiLED shield is complete! Note: On the back of the shield there is a solder patch to activate pin 5 instead of pin 1 as the digital input. 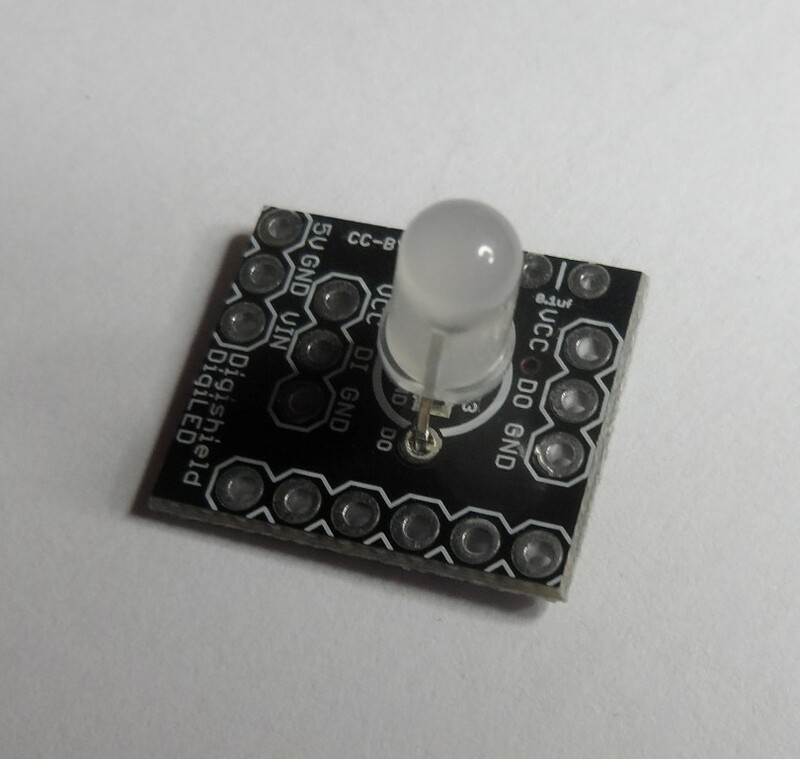 If you are not using the DigiLED as a shield onto the DigiSpark Pro and planning on running it at a distance, you only need to connect the specified digital pin (Pin 1) and bottom 3 pins (5V, GND, VIN). You do not need to connect all 6 pins on the right-hand side of the shield. When chaining multiple DigiLED's together, you only need to connect 3 points as a daisy chain using VCC, DO>DI and GND. 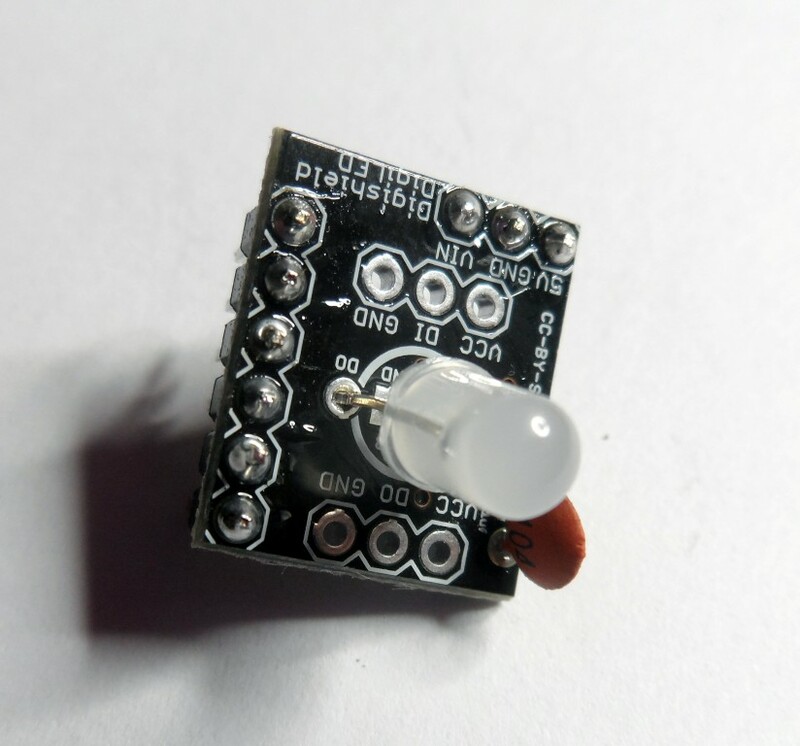 For example, LED #1 would need the top 3 pins VCC, DO (out) and GND to connect to DigiLED #2's VCC, DI (in) and GND on the second row from the bottom of the board. If you added LED #3 you would need to connect DigiLED #2's top three pins to the second row from the bottom on DigiLED #3 and so-on and so forth. 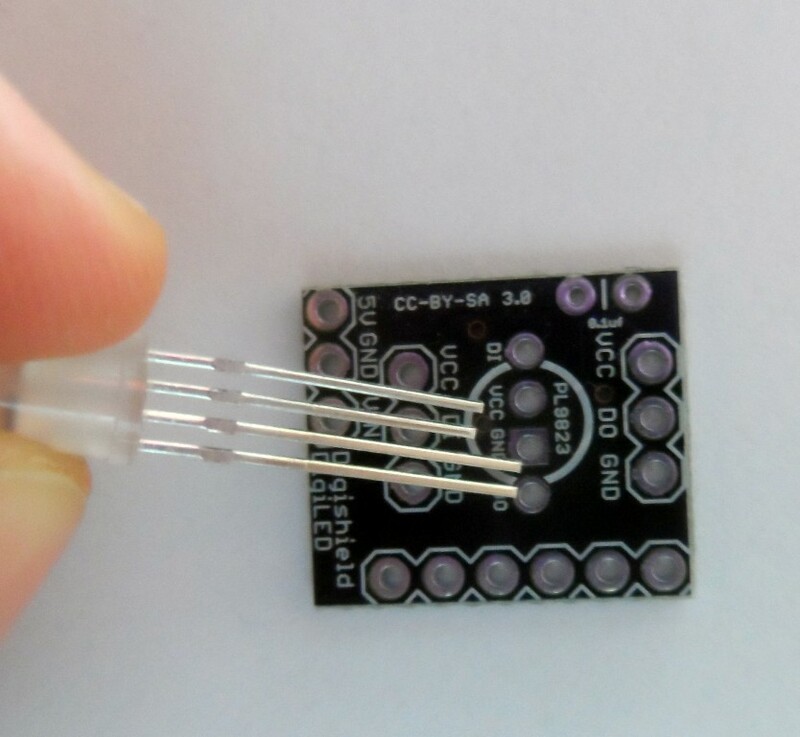 After DigiLED 1, the side pins and 5V, GND, VIN should not be connected, only the three input and output points for chaining. If you have a single DigiLED, the following code sample will make it continuously cycle through white, cyan, violet, yellow, red, green and blue. 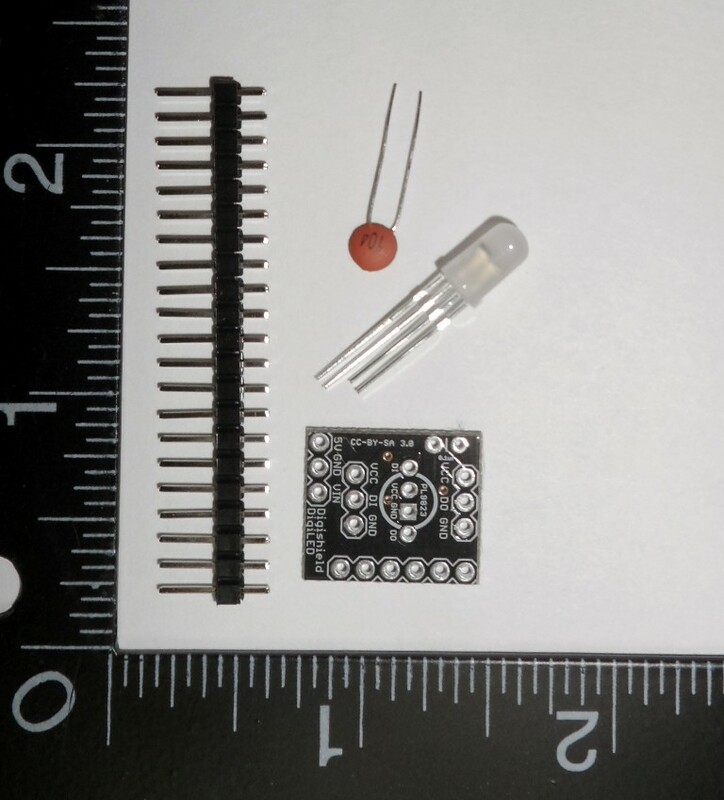 // Which pin on the Digispark is connected to the DigiLED? // How many DigiLEDs are attached to the Digispark? If you have more than one DigiLED daisy-chained, the following code will make all the DigiLEDs light up green. You need to change the NUMPIXELS variable to the number of DigiLEDs you have chained together.